Few months back we posted an article on Dell’s announcement of its Android web tablet. The 5 inch internet tablet from Dell was earlier known as Dell mini 5. Now today a web blog confirmed the name of this tablet as Dell streak. The Dell streak is not just a internet surfing device. It has the option to insert a SIM card into it. So on launch, streak will surpass HTC HD2 and LG GW990 on its screen size. Dell streak comes with Google Android OS, and has a 5 mega pixel camera with LED flash. 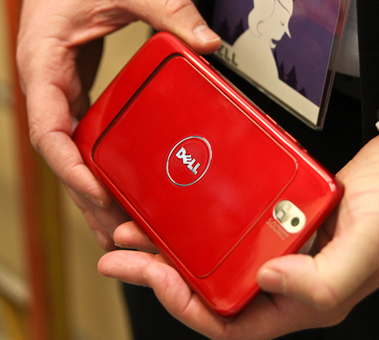 The device will be available in several customizable color combination and designs like Dell Studio laptops. 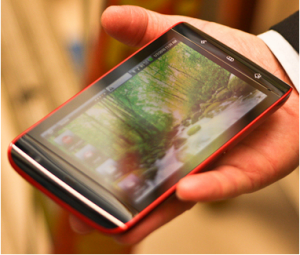 As said earlier, the Dell streak has a 5 inch touch screen WVGA screen with 800*450 resolution. Under the screen, there is a set of navigation buttons with capacitive touch support. Other than the 5MP autofocus main camera, there is a front VGA camera for video calls. Streak would be a 3G enabled device with Bluetooth, WiFi and other connectivity features. The Dell Streak is expected to include the latest Android 2.1 update. Thousands of applications are available at Android market place. The leaked documents on Engadget shows that Dell Streak would also include few Amazon applications like Kindle e-book reader. 5″ (12.7 cm) WVGA (800 x 480) with multi-touch support. 3G networks@ HSDPA 7.2 Mbps / HSUPA 5.76 Mbps. 5MP back camera, VGA front camera. 512 MB ROM + 512 MB SDRAM + 2 GB non-user accessible MicroSD. WiFi, Bluetooth, GPS, music player and Google apps. Dell streak is now available in USA though AT&T network . The suggested market price of Dell Streak is 299.9 USD with two year contract. The contract free version Dell steak costs $599. When you get a Bluetooth headset, Car Dock, or Home Dock, the price changes to $579, $589 and $619 respectively. The latest market price of Dell Streak in India is 34500 INR.